It hasn’t always been common practice to switch your tyres during the colder months but, with recent winters proving to be harsher, more and more of us are taking the time to install winter tyres on our cars. Most manufacturers will tell you that you should switch to winter tyres as soon as the temperature falls consistently below +7℃, but why is this? What is the difference between winter and summer tyres? 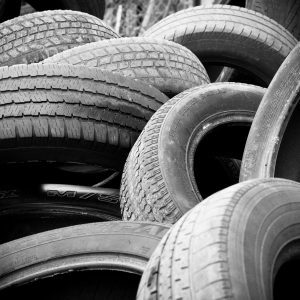 Both winter and summer tyres contain rubber. However, those optimised for the colder months contain a higher natural rubber content. This is to prevent them from becoming rigid and keeping them soft enough to interact with the road. The softer a tyre is, the easier it is for it to grip to the road, preventing skidding and improving handling. On the other hand, summer tyres such as the Goodyear Effgrip Perf are made from slightly different compounds. Their makeup of slightly higher synthetic materials means that they perform well in warmer temperatures, however, will quickly harden as the temperature falls. Contrary to what some believe, summer tyres aren’t limited for use in dry conditions and will last longer used in wet weather above 7℃ than winter ones – which will begin to quickly wear when used in warmer climates. The patterns on different tyres aren’t just there for decoration, different tyre types have certain grooves in their tread designed to make them fit for purpose. In the case of winter tyres, this means that they have a deeper tread pattern. If you look for yourself at the difference in the patterns on a summer tyre like the Goodyear Wrangler HP and Goodyear UltraGrip 9 you can see clear differences in their structure, which optimise them for the conditions they’re designed for. Not only does the tread on a winter tyre typically start at 8 or 9mm rather than the 7 or 8mm for a summer tyre, but the grooves themselves are also deeper and wider to improve grip. Although this may seem like a small change, it actually creates a big difference in how the tyre handles ice and snow. The deep channels provide an area for the tyre to cling to and combat the adverse weather to make your driving experience safer and lowering stopping distance. In the case of summer tyres, the tread is not as deep, meaning they work well in wet and dry weather conditions but their performance is greatly hindered by snow and ice. As the temperature drops and the rubber compound in summer tyres begin to chill, it can lead to cracking which will then further impact the tread and overall safety of your car. Some people choose not to switch tyres at different points in the year as it can be costly. However, not changing your tyres can actually result in them needing to be changed more often which can be costly in itself. When you drive on winter tyres above their recommended temperature of 7℃, suddenly the pliable rubber which is beneficial in the cold will quickly wear and no longer benefit your handling. The wear, in this case, can be severe enough to offset the money you would save by not buying winter tyres in the first place. When it comes to not switching from summer to winter tyres, the issue lies less in wear and more in how the car handles in the cold. As already mentioned, in the colder weather, the high organic content of winter tyres keep them supple and able to interact with the road. However, summer tyres are harder and therefore become stiff and can crack, causing further issues.